The margin for error remains thin for the USMNT, but coach Bruce Arena has pushed the right buttons and the vibe around the team is as good as it’s been in years. NEW YORK—At the deepest, darkest point, Michael Bradley still saw a way out. Long-suffering Toronto FC outshot and outplayed the visiting Seattle Sounders in December’s MLS Cup final only to fall on penalty kicks. That heartbreaker came shortly after the trauma of two World Cup qualifying defeats with the US national team, including a loss to Mexico in the once-impregnable fortress of Columbus. Those reversals put the Americans in an unprecedented 0-2-0 Hexagonal hole and led to coach Jurgen Klinsmann’s dismissal. The thought of starting over or erasing a heavy deficit can be daunting. And doing so certainly isn’t a given. But as the summer of 2017 draws to a close, it’s become difficult to see those winter depths from where TFC and the USA currently stand. Toronto is tearing through one of the most impressive regular seasons in MLS history. And the national team, which meets Costa Rica Friday evening in a pivotal qualifier at Red Bull Arena, is on a 14-game unbeaten streak that includes a CONCACAF Gold Cup title. For Toronto, the biggest games are down the road. For the USA, they’re here and now. At 2-2-2 and in third place in the Hex with four games remaining, Bradley and Co. have cleaned up a good chunk of the mess created last year. In fact, with victories over Costa Rica and then Honduras on Sept. 5, they could even punch their ticket to Russia before qualifying concludes in October. The vibe around the national team—the level of self confidence and focus—seems as good or better than it’s been in years. Arena has pushed the right buttons, simultaneously creating a sense of competition and community within a team that’s weathered injury, lineup changes and on-field adversity to reach the threshold of a World Cup. The margin for error remains thin. A loss Friday could be catastrophic. But it’s hard to imagine the USA entering these games on a bigger high. 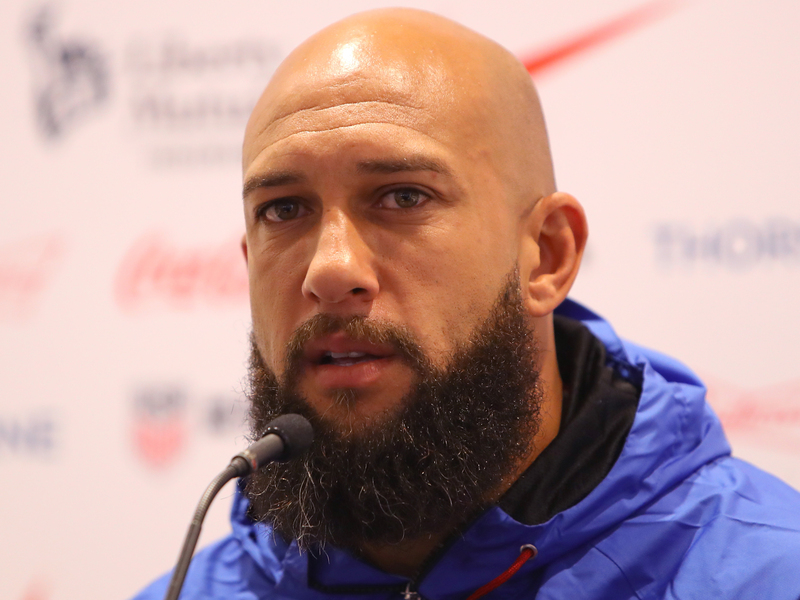 Bradley and goalkeeper Tim Howard, each of whom is hoping to play in a third World Cup, offered ample credit to Arena and his staff for putting the framework in place. Arena hasn’t had time to engineer an overhaul, but that wasn’t necessarily what the USA needed. It simply had become too cluttered and confused under Klinsmann, who often seemed more committed to introducing new wrinkles, challenges and tactics than to establishing consistency, predictability or internal coherence. Arena has given his players room to breathe while being more methodical in his preparation. Players have a sense of who they are, where they belong and what they need to do, and that’s brought the group together and led to nine wins and five ties in 2017. Form is a difficult thing to gauge on a national team. Camps are intermittent and rosters change. Christian Pulisic, for example—the third USA player at Tuesday’s Manhattan news conference—wasn’t part of the squad that claimed the Gold Cup title last month. The constant, Howard stressed, is the coaching staff. Form is established “by the expectations set in terms of how quickly we come together and form a team when we come into training camp,” the goalie said. Arena has a knack for nailing the intangibles. Howard referenced Pulisic, who seems energized rather than overawed by the spotlight, and new players like Jordan Morris and Kellyn Acosta who have moments of maturity beyond their years. Clint Dempsey, who’s a goal away from breaking Landon Donovan’s US scoring record, immediately came to mind as Howard spoke. The 34-year-old striker returned from a 2016 heart ailment and has been finding the net for both the USA and Seattle, in part because he’s been willing to take breaks or come on as a substitute. Graham Zusi’s embrace of a transition from attacking midfield to right back, giving the Americans priceless depth in a position of need, is another example. “The biggest sign is always the mentality of a group,” Bradley said when discussing what’s fueled the unbeaten run. “Having a group of guys, together with the staff, who feel like they’re in something together, and it’s not just a bunch of guys who come in and are looking to do their own thing and who care about themselves and what’s good for them as individuals. The only chance you have is to have a team full of guys and people around it that understand that everybody has to give a little bit of something—a little of what they are—to make everybody else around them better. It hasn’t always been pretty or perfect, of course. The makeshift team Arena deployed during the Gold Cup’s group stage labored at times, and it took a while for the Americans to get off the ground in June’s home win over last-place Trinidad & Tobago. Injuries to John Brooks and DeAndre Yedlin will test the back line at RBA and in San Pedro Sula, and competition for positions up front and alongside Bradley could make for some difficult decisions. But at the moment, optimism is the prevailing emotion. The unbeaten streak is the longest since 2005. Most of the best players are in camp and in form. Pulisic is emerging as a gamebreaker the likes of which the national team hasn’t seen, while Bradley, Dempsey and Altidore are at or near the height of their powers. No ticket to Russia is guaranteed, but given the start last November, it’s hard to imagine the USA wishing its situation was much different. “I think our team is very excited for the opportunity to play at Red Bull Arena against Costa Rica … We’ve worked real hard to position ourselves—to be in position to qualify for the 2018 World Cup,” Arena said Tuesday.